After the passing of one of the areas greatest fight promoters, Rumble Time Promotions' Steve Smith, in 2015, Fighting for Autism's Brian Higginbotham approached Knuckle Junkies with the idea of creating an annual award alongside the annual STL MMA Awards to honor the legacy of Smith. Smith and Blake Fischer with Rumble Time Promotions were the first promotion affiliate of Fighting for Autism and were there to support Fighting for Autism efforts with no questions asked. They embodied philanthropy in a way that was unparalleled. Their support and open door for Fighting for Autism really propelled the organization's growth in St. Louis. Wishing to honor Steve's giving nature, standards for excellence in our sport both in and out of competition, and his trademark phrase of "Let's Go! ", the Annual Steve Smith "Let's Go!" Award came to fruition in 2016 with Adam Osmoe being the first recipient. To achieve this award, nominees must exhibit a good "in fight" performance record for the year, but more importantly live a particular way outside of competition and dedicate themselves to selfless community service and philanthropy, and exhibit a role model character. 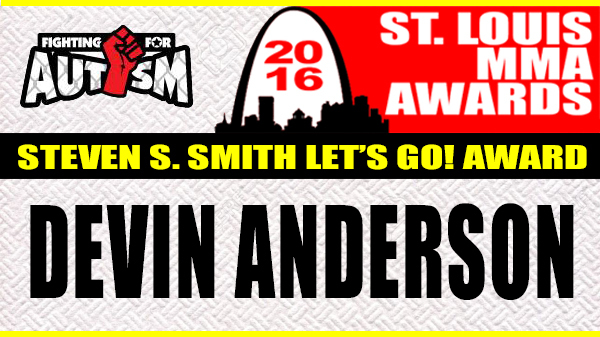 After several nominees were considered that met the criteria for the 2016 award (all fantastic people both in and out of competition), we would like to congratulate Devin "Ace" Anderson for being the winner of the 2016 Steve Smith "Let's Go!" Award. Anderson had an impressive year in the cage and ring, with a 3-0 record including two knockout victories over Aaron Kuhl and Cody Naucke, but had an even more impressive 2016 outside of competition which put him ahead of the nominees for this years award. Throughout 2016, Anderson has given back time and time again. Through his promotion, Horizon FC, he dedicated all of his shows to charitable or community causes, including a Tribute to the Troops show where veterans were provided free VIP seating and recognition during the event, a Breast Cancer Awareness show that dedicated awareness to the condition, and an Autism Awareness event dedicated to Fighting for Autism, where both awareness and funds were raised to support the Autism community. In addition to the Horizon FC charitable events, Anderson dedicated time throughout several months to deliver food to the homeless, and most recently sought out providing donated blankets to the homeless, in addition to seeking employment in the public service sector, working for the St. Louis County and now St. Louis City Medical Examiners Office. On top of charitable work, Anderson has dedicated himself to be a mentor to youth competitor and AOC teammate, Jeralyn "Superstar" Spear, who always showed up to help with the food deliveries to the homeless and was there both in competition and as an honorary ring girl for Horizon FC events. Spears told us that, "Devin (Ace) has been a mentor for me for a long time. He has been my number one fan. Ace has pushed me through strenuous workouts when I felt like giving up. He also helped to teach me about others when he invited me to help fill bread trucks for homeless vets. He has pushed me and has always been positive. He helps everyone and I couldn't imagine where I'd be without the help he has gave me. He may call me a "Superstar" at the end of the day, but he is definitely someone I look up to." Anderson trains at AOC, in Wentzville, Missouri under coach and professional fighter, Kain Royer, who is a notable philanthropist himself, and holds his students to living the martial way. "Devin started with AOC three years ago. Right away I could tell that Devin had a good heart," Royer said. "As Devin got more experienced, he expressed his drive to do good things for the MMA and local community, and he started doing benefit shows and food drives. As the shows went on, he gave almost all of the profits to the employees that helped him, in addition to the donations to various causes. I have worked with several promoters in the area and can tell you that Devin actually cares about the fighters and helping them. I think being a fighter himself gave him a perspective of how to properly treat fighters. I'm proud to have such a dedicated and driven student, and as a friend, Devin is truly a fiercely loyal person and understands what it means to be there for a friend." Congratulations Devin on becoming the second Steve Smith "Let's Go!" Award recipient! Your dedication to serving the community and mentoring youth competitors is well appreciated and recognized. 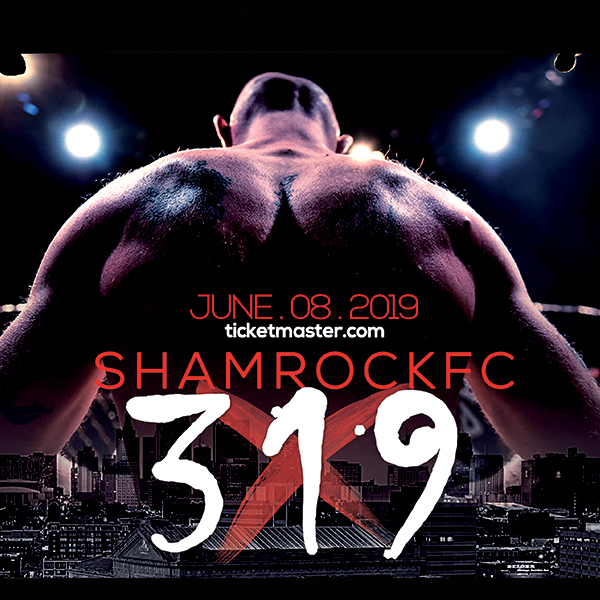 We hope that this annual award will motivate the fighters in STL MMA to live a life that positively impacts their community and to be role models to those around them.